Do you want to be better than Apple at branding through live video? There is no room for mistakes. We are live in 3, 2, 1, GO! The motto of Web 2.0 is “Everything will be exposed” (Christodoulides, 2009). It transformed branding from a one-sided bowling game into a pinball game (Hennig-Thurau et al. 2013). Next to posting images, blogs and articles, a new social trend has found its place: live video. Fast Internet and increased mobile device penetration made video streaming popular. 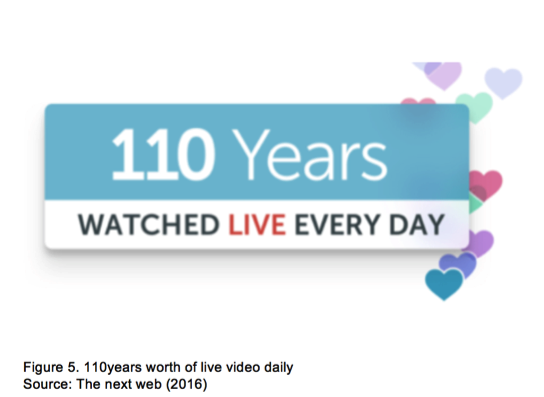 Although live video is a lot older than you think, it gained popularity only in the last few years. Due to the desires of the consumers to peek behind the scenes and see how their favourite brands create, execute and interact, we moved from the age of secrecy with recorded videos to a new age of transparency with live videos (Fournier & Avery, 2011). Live video is highly desired, informative and fun (Forbes, 2015). But what makes it so attractive for companies? It is easy to produce, broadcast and it is cost effective. There is no special knowledge or equipment required. A smartphone with a camera and Internet connection is enough. On top of that, live video content shows that your company is up with the trend, willing to involve your followers in your daily work (Forbes, 2016). In this way, you can create a community to which your doors are open for live feedback, questions and comments. This way you can educate about your brand promise and increase their trust, as you show them that there is nothing to hide (Socialb, 2015). Branding yourself with a logo and a few articles is not enough anymore. People want something extra from you. Live videos provide richer content, that is why they became so popular (Forbes, 2015). How can we be certain? 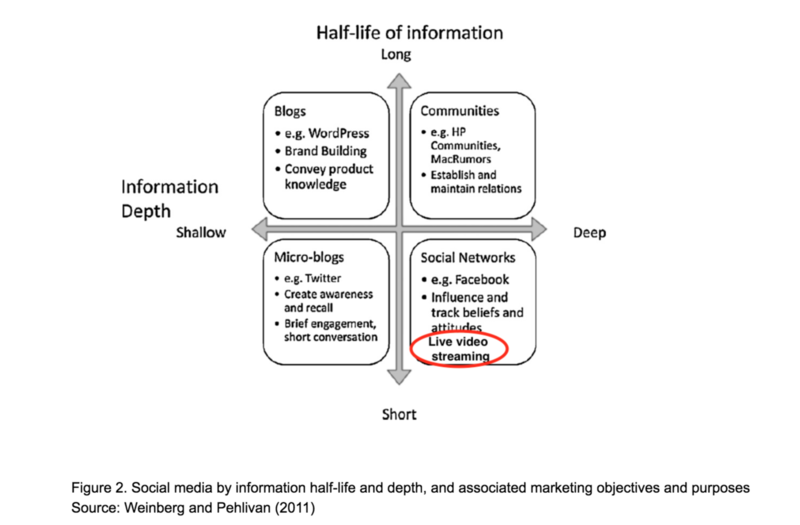 Looking at the model created by Weinberg and Pehlivan (2011), live video can be positioned in the area with a deep content, since brands have the ability to share intimate information. At the same time, live video has a short half-life due to the limited availability on the all social platforms featuring this function. Sounds attractive to you? Here is the checklist you should follow before you dive into the world of live video. 1: Is it suitable for your brand? “To be, or not to be?”, that is the existential question. The concern here is whether to use live video as a way of branding or not. Here are some questions that will help you decide. If you answer “YES” to any of them then a live video is the tool for your brand. Is your target audience attracted by live videos? Do you want to grow and/or diversify your audience? Do you want to encourage social exchange among your followers, by enabling them to build their own identities (Deighton & Kornfeld,2009)? Then live video is the right solution for you. Now, if you have chosen to start using live videos, it is time to find out which are the best platforms that will suit your needs. Click here to see a comparison of the 5 most popular tools that support live video. If you want a high demographic reach and up to 4 hours of streaming then Facebook Live is the right one for you. On the other side, on Instagram Live, your live video can stand out in the stories feed of your followers, boosting your visibility (Lifewire, 2017). Although Youtube and Periscope are not social platforms they are both good solutions if you want to broadcast longer videos and gain extended viewership metrics. If you are a gaming company then your platform is Twitch. Live video is like improv theatre as it creates an uncontrolled and unpredictable environment, allowing much more role diversity for all the players involved in the production (Singh & Sonnenburg, 2012). On one side is the brand owner in the role of the director having only one chance to impress the audience (Singh & Sonnenburg, 2012). On the other side are the consumers in the audience’s seat. How to create, as a director, attractive content that sparks positive consumer engagement? To do that, you must provide your audience with the content it wants. It is easy! You need the narrative pieces: goals, wants, conflict, and resolution. Lets’ see how do you put these together in your video. Every video must have a goal. For example, do you want to drive brand awareness, lead generation, create partnerships, enhance customer service or increase sales? Whatever your goal is, your live video needs to have one, in order to measure it easily. Your brand performance is related to understanding the audience’s wants. For example, technology fans might like product unboxing, reviews, and demonstrations. To find the audience’s wants, follow the clues left all over the Internet. Examples of clues are keywords they used to reach your website, the most visited pages on it, social activities and popular hashtags. Now that you know the wants of your audience, you need to create tension. It will be the main trigger for emotionally involving the consumers into the narrative by provoking and exciting them (Singh & Sonnenburg, 2012). For example, challenge some of the latest trends or hot topics by presenting a new perspective. After you know the important points for your audience, start planning your big story around them. It should also align with your brand’s identity, the company’s mission and resolution (Visualstorytel, 2017). There are risks that brands should consider before diving into the world of live video. We are not in the era of secrecy anymore, where you have the luxury of time and endless amount of trials before producing superb footage. The brand owner can train before the performance, but once on stage, there is no room for mistakes. The actors need to learn how to quickly overcome them without damaging the brand reputation. 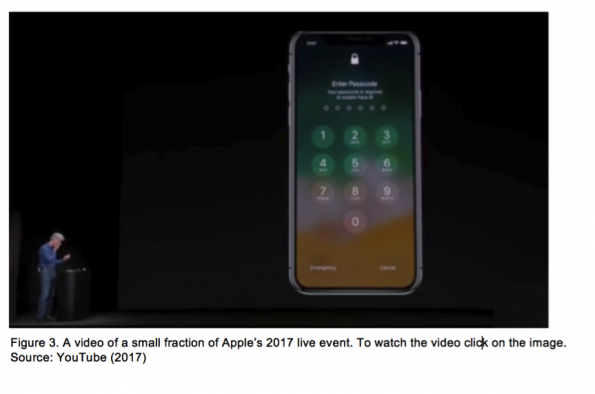 Before we go into details, let’s watch a small fraction of Apple’s 2017 live event(click on the image to load the video). Did you see what went wrong? 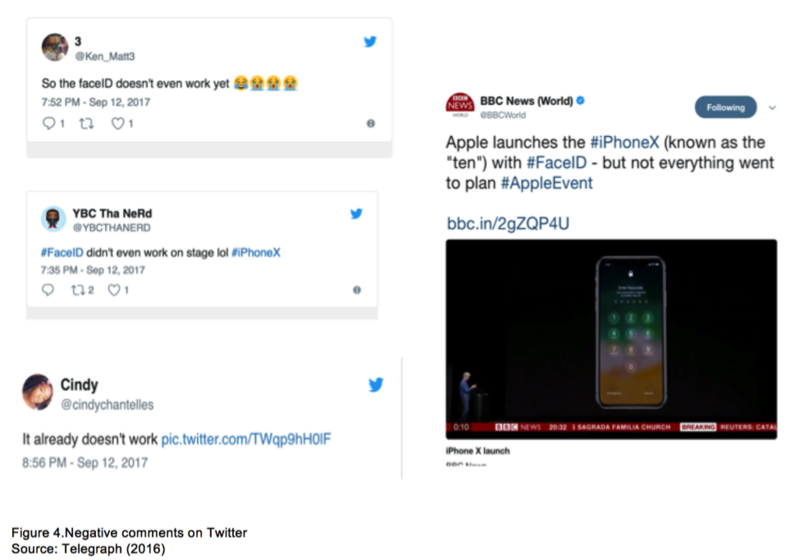 As The Telegraph (2017) wrote, the launch of iPhone X did not go exactly as it was planned. The senior vice president of Software Engineering tried to unlock the iPhone by using Apple’s new facial recognition software. When the phone failed to unlock, he told the audience: “Let’s try that again”. And then suddenly the phone asked for a passcode, so he was forced to take a backup device to continue with the demonstration. At the moment the device locked itself the social media exploded with negative comments and images. People started questioning the quality of the iPhone X. This mistake is just one of the many risks that can occur during your live video session. There are three categories of risks. Technology risks related with the network connectivity or problems with the product demonstrated. Information risks of saying something inappropriate, untruthful, or even missing crucial statements. Accidental risk of revealing trade secrets or upcoming products. Here is how you can manage those risks. The first step in mitigating risks is to be prepared for them. Go back through your narrative pieces and try to find situations in which something might go wrong. Then prepare a list of actions that you can perform if such a problem occurs during the live video. Fast reactions will allow you to lower the effect of the mistakes later on. Since the live videos are broadcasted using the Internet, there is a chance of connection failure -create a backup plan. Efforts to correct the mistakes do not finish with the end of the broadcast. The brand owner must continue this afterwards. In a situation of negative consumer-generated brand stories or false accusations, you have to react as soon as possible. You should deny any accusations if they are false. If they are true, apologize, explain and/or compensate. These few actions could mitigate the consequences of small hiccups. Keep in mind that the currency in which you will pay for your inactions is your expensive brand reputation (Fournier & Avery, 2017). I have only one recommendation for you. Study this checklist and then dive into the sea of 110 years of live video watched every day!